Continuing on from my last post, I went a bit crazy with the yankee candles! My boyfriend and I went to the outlet village and they had a huuuuuuuge yankee candle sale on, so I went a bit mad! It has a really light cinnamon smell to it, and kinda reminds me of pot-pourri, this was Blakes favourite! RRP: £19.99 Price I paid £9.99. This one reminds me of spring and is super refreshing. It's a candle I will use to wind down in the evening. I am completely in love with this candle, it smells just like fresh daisies and I can't stop using it! LOVE. The sprays in between are Beach Walk I bought one of them, and the other came free in a gift set I received for spending £40. I also bought Blake a car smelly Pink Sands of course so it smells all girly! They are so good and they last, I recommend getting one. This smells incredible, I never could imagine the 2 smells together but they work so well! Next time I go to the outlet i'm going to buy some goodies for a giveaway so let me know on instagram what your favourite yankee candle scents are! 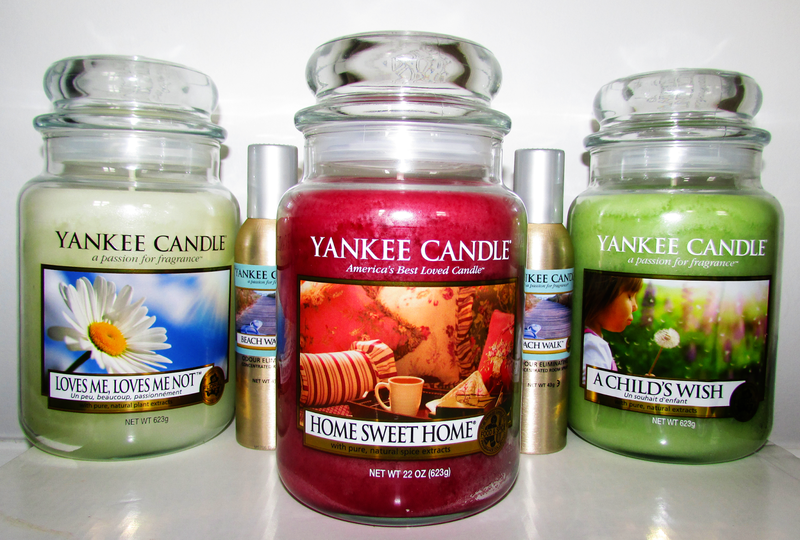 I love Yankee Candles - I can recommend Summer Scoop - smells just like ice cream it's so yummy! Looking forward to your post about the gorgeous clothes you bought from H&M!